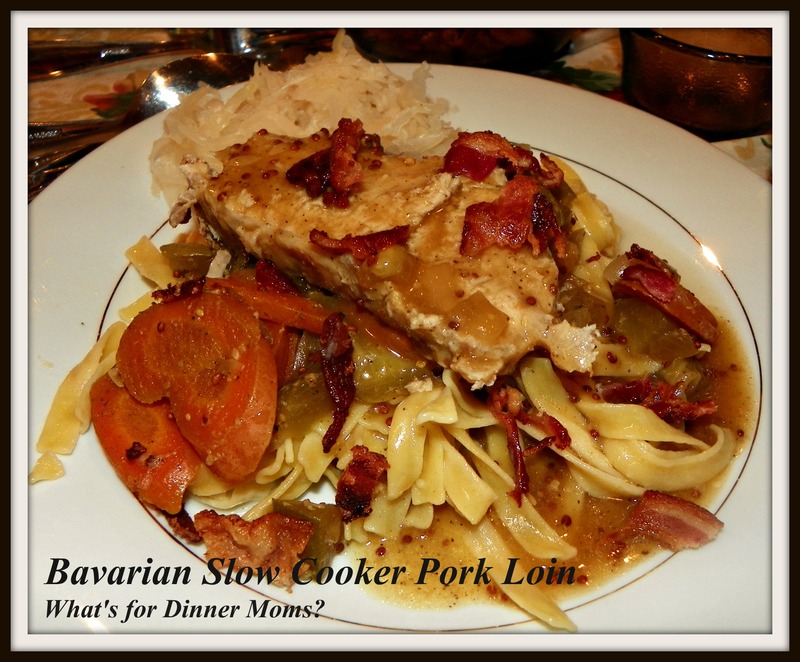 Bavarian Slow Cooker Pork Loin – What's for Dinner Moms? Last night at dinner my kids were talking about what meats they liked best. My son said he prefers chicken breast. My daughter said, “Want to know what part of the chicken I like best? Steak.” Yes, we have been eating a great deal of chicken and pork lately. Here is one of our most favorite Slow Cooker Pork dishes. I have been cooking pork quite often the past few weeks. It has been fairly inexpensive and I can make it into so many wonderful dishes that my kids and I don’t feel like we are eating the same dish over and over again. When I can purchase whole pork loins or pork roasts for less than $2.19 a pound I buy several and cut them up myself before I freeze them. Some I just chunk into 2-2 1/2 lb. sections to freeze, while other pieces get cubed to make into Chinese food or casseroles. It makes it easier when I am deciding what to make for dinner that most of the meat is already cut. One of the kids pulled out a pork loin for dinner and I had a tough time deciding what to do with it. Then I remembered this beef dish that I had been thinking of trying. It could work with pork, right? I had to try. This meal was hands down voted the best meal of the year so far. I have had lots of really good meals lately but everyone asked for this one again soon. They actually were arguing over who got the leftovers for lunch. My family loves vinegar and that sweet/tart taste. This was a great balance of that. The bacon and pickles were salty while the noodles and the pork balanced out those flavors. I served this with a side of warmed sauerkraut. Trim any visible fat from the pork roast. In a large skillet heat the oil over medium high heat until very hot. Brown the roast on all sides, turning every 2-3 minutes. In the slow cooker bowl place the carrots, onions, chopped pickles and celery. Once the meat has been browned place the meat on top of the vegetables. Pour in the beef stock, mustard, pepper, cloves and bay leaves. Stir to mix. Remove meat and vegetables with a slotted spoon from the slow cooker to a plate. Carefully pour the remaining liquid from the slow cooker into a saucepan. Remove bay leaves and skim off any visible fat. Mix Cornstarch and 2 TBSP beef stock int a small bowl until smooth. Pour into saucepan. Simmer over medium heat until gravy thickens. It it is not thick enough repeat cornstarch and beef stock mixture again until desired thickness is achieved. Taste and adjust spices as necessary. Serve meat and vegetables over noodles with hot gravy. Sprinkle with crispy bacon and additional pickles before serving. Your kids are a hoot! This sounds super-tasty Marci! Thank you! They are something all right! I’m sure the taste is as amazing as it looks, thx for the recipe ideas!